While majority of the attention is centered on the 2017 CX-9, CX-5, and MX-5 RF, Mazda Philippines also managed to show off the updated BT-50 at the Manila International Auto Show. Continuing to ride on the most solid of foundations (it’s won the Philippine Truck of the Year in 2012/13), it gets aesthetic updates that align it more closely with Mazda’s corporate KODO – Soul of Motion design language. Shown mid last year, it took a while for the revised BT-50 to arrive in the Philippines. Though it isn’t designed with KODO in mind, the BT-50’s re-shaped front-end manages to modernize the design. For 2017, it gets a re-shaped front-end with smoked headlights, a new grille, and revised bumpers. At the back are new combination lamps as well. At each corner are also newly designed dark-silver machined finish 17-inch alloy wheels fitted with 265/65R17 tires. Inside, the BT-50 continues to be well-loaded with leather seating, dual zone climate control, automatic dimming rear view mirror, and Bluetooth voice command all as standard equipment. Also standard across the line-up are dual SRS airbags, ABS with EBD, and even Dynamic Stability Control. Parking sensors are also standard, but the range-topping 3.2L gets the additional benefit of a reverse camera. Mechanically, the 2017 BT-50 continues unchanged. The rear-wheel drive variants are powered by a 2.2-liter 4-cylinder CRDi engine with 150 horsepower and 375 Nm of torque. 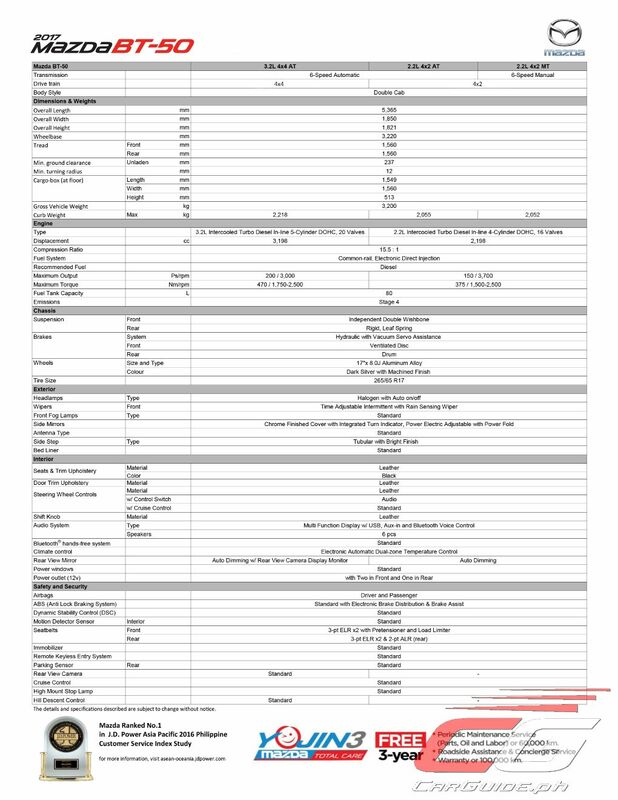 Transmission option is either a 6-speed manual or 6-speed automatic. Meanwhile, the four-wheel drive variant has a 3.2-liter inline-5 CRDi with 200 horsepower and 470 Nm of torque. It’s available solely with a 6-speed automatic. 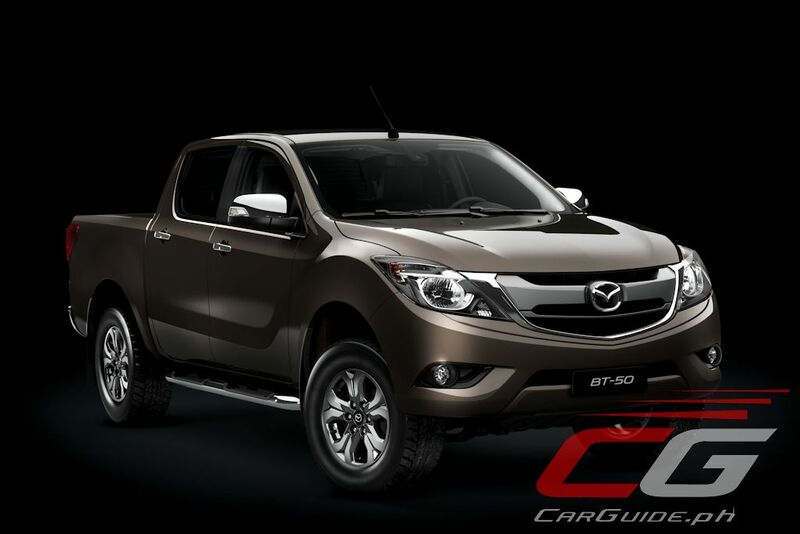 Pricing for the 2017 Mazda BT-50 has been bumped up slightly with the 2.2L RWD 6MT going for P 1,350,000. 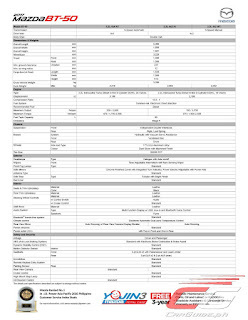 It goes up to P 1,395,000 for the 6AT, and P 1,550,000 for the 3.2L 4WD 6AT. Available colors are: Aluminum Metallic, Jet Black, Deep Crystal Blue, Titanium Flash, and Cool White. It's useless beating a dead horse. The BT-50 has died a long long time ago. 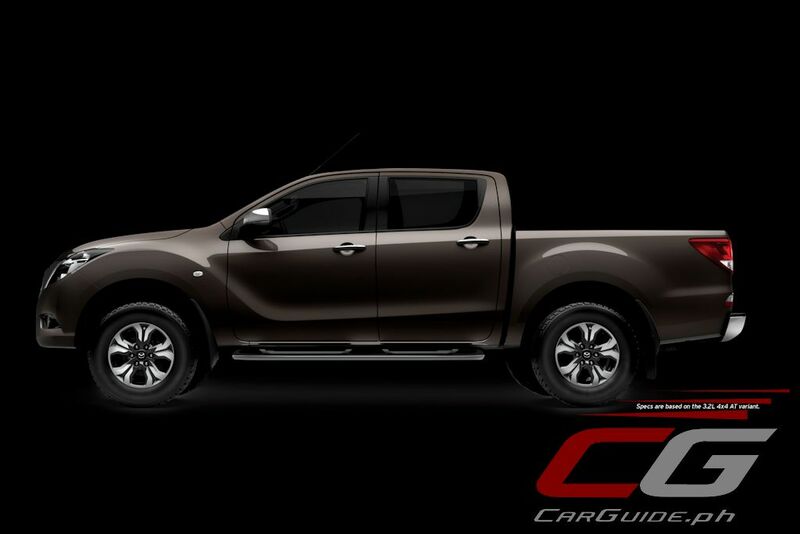 To be in the competition, Mazda should focus on its new Pickup Truck project with Isuzu as reported few months ago. Dono why they still bothered to update it. It's almost non-existent here. Too expensive and forgotten. I don't think why people think it's too expensive. The BT-50, across all variants, has rain-sensing wipers, automatic headlamps, cruise control, power-folding mirrors, auto-dimming rear view mirror, not to mention leather everything. If this thing is expensive, then what do you think of the Hilux which is as bare as a car from the Flintstones? 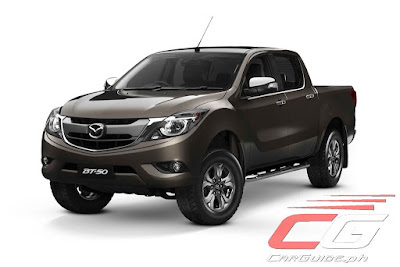 It's one of the most powerful pickup available and loaded with features way better than the other pickup trucks... Mazda needs to give it a boost in terms of Ads & marketing. Its a headturner since its few and looks expensive.